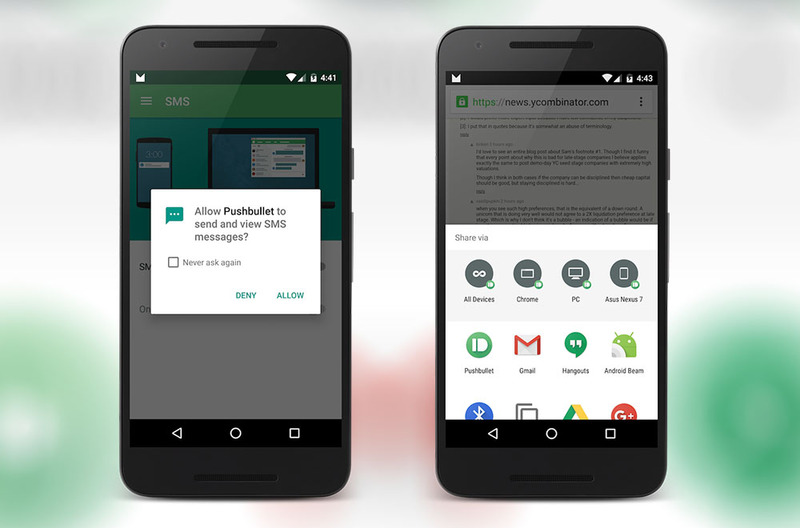 Pushbullet, a multi-platform device-to-device sharing app we use numerous times throughout the day, is receiving an update today that gets it all sorts of cozy with Android 6.0 Marshmallow and its new features. The update introduces support for runtime permissions and Direct Share, so you not only get to specify to Pushbullet which permissions of your device that it can access, you can also now share even quicker. With runtime permissions, Pushbullet will now ask for your permission to do things like view your SMS messages, contacts, phone, and storage. Pushbullet is actually asking during the setup process, for access to these permissions, so you can allow or deny upfront. As for the Direct Share addition, this should now make for easier and faster sharing. With Direct Share in Android 6.0, developers are able to specify targets in the share menu, so if you have Pushbullet enabled, rather than just seeing a list of apps to share items through, you should also start seeing shortcuts to specific items in Pushbullet that you might want to share with. Take for example the image above, which shows a web page being shared. You get the familiar app sharing menu at the bottom, but on top of it there are quick shortcuts for sharing to all of your device in Pushbullet, sharing to Chrome, your PC, and a specific device in the Nexus 7. The Pushbullet team also says that these Direct Share options should get smarter over time, through additional updates. The update should be live shortly if it isn’t already.